Oil stains are some of the most difficult to move since they often get ignored or dismissed as simple to fix. The problem with oil stains is that instead of leaving a brightly stained area, they tend to leave a slightly darkened area that may be difficult to notice right away. This area darkens with age unless it is removed quickly. And if the piece of clothing and oil stain dry, the stain can be set permanently. Oil stains can be difficult to get rid of fully. The first problem is that they are difficult to see. You might overlook the stain because it won't be a bright color different than the color of your clothing. Instead, the oil stain is a slightly darkened area on the laundry. Add to this the fact that oil stains can commonly reappear just when you think you've seen the last of them and you've got a tough stain to deal with. To remove oil stains, you'll need hot water and detergent. Soak the stained area before washing in the hottest water the clothing will tolerate. Rub liquid laundry detergent or liquid dish soap onto the stained area. Both of these will do a great job at penetrating the fibers and getting into the areas of the fabric that are holding on to the oil. It is vital that you check the stained area before you dry it to make sure the stain is fully gone. When in doubt repeat the stain removal process. If you have dried the oil stain accidentally, you'll need to repeat the process or hot water and liquid detergent several times to get results. Add a good laundry stain remover, and you might just rescue your laundry from an oily mess. 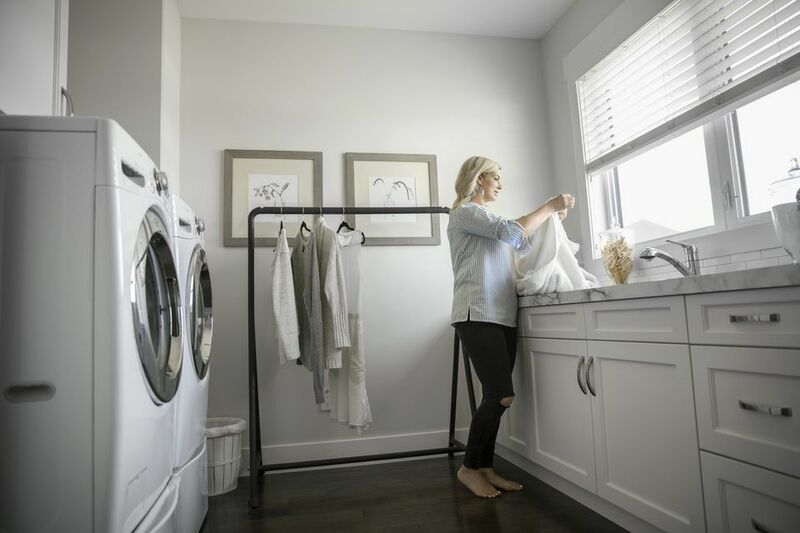 Your best bets are liquid laundry detergent or a great liquid dish soap. These are born grease fighters. You can also put a paste of baking soda on the stained area to try to draw up some of the oil. A gel stain remover is another great option since it penetrates well into all the fibers of the clothing. A liquid stain remover can do a great job, too. But make sure that you don't allow the stain remover to dry on the fabric. Sometimes you have a stain that is a combination of an oily stain and another type of stain. Deal with the oil first. Instead of using hot water, try warm water and a good liquid detergent or stain remover. Repeat this as much as you need to before treating for the other stain type. Then at the end, hit the stain with hot water and more detergent. Allow the clothing to air dry to make sure that the stain was removed. If no hint of darkness remains, go ahead and wash and dry normally.